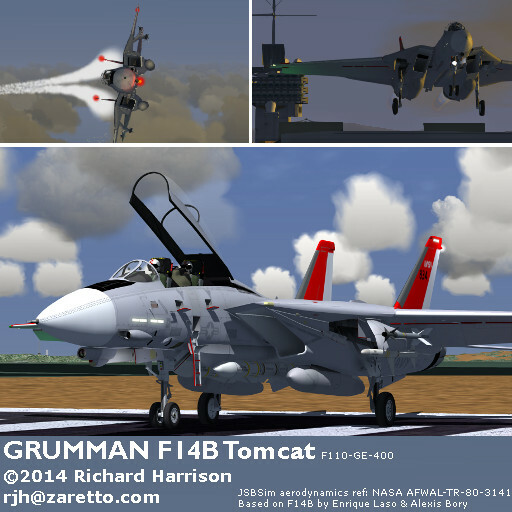 This F-14 simulator for FlightGear supports the F-14A, F-14B variants, with a multiplayer RIO option. The aerodynamics in the FDM are based on real wind tunnel data and cover the full range of flight operations, including stalling and realistic spinning. This F-14 simulator has a realistic F-14 Flat Spin that is unrecoverable as in the aircraft. The F-14A with the Pratt and Whitney TF-30 engine is famously sensitive to compressor stalls, and this engine is responsible for many airframe losses. The TF-30 model includes a configurable compressor stall, including MCB failure. The compressor stall is simulated based on engine pressures (PB) and the affect of angle of attack and sideslip on the inlet airflow to produce a representative compressor stall. As the compressor stall is based on inlet pressure it is still possible to stall the engine at higher speeds during high G manoeuvering. When the compressor stalls there will be a small pop (from the corresponding side). However it is easy to miss this, and particularly on approach when coming in with surplus energy it is possible to keep this in check with rudder and stick and only when increasing power, especially into afterburer, when the yaw moment becomes uncontrollable and an airframe loss is the likely result. Monitoring the engine gauges during your scan will allow you to detect a compressor stall by the reduction in RPM. Recovery procedure is simply to move the throttle for the affected engine to idle and wait for recovery. 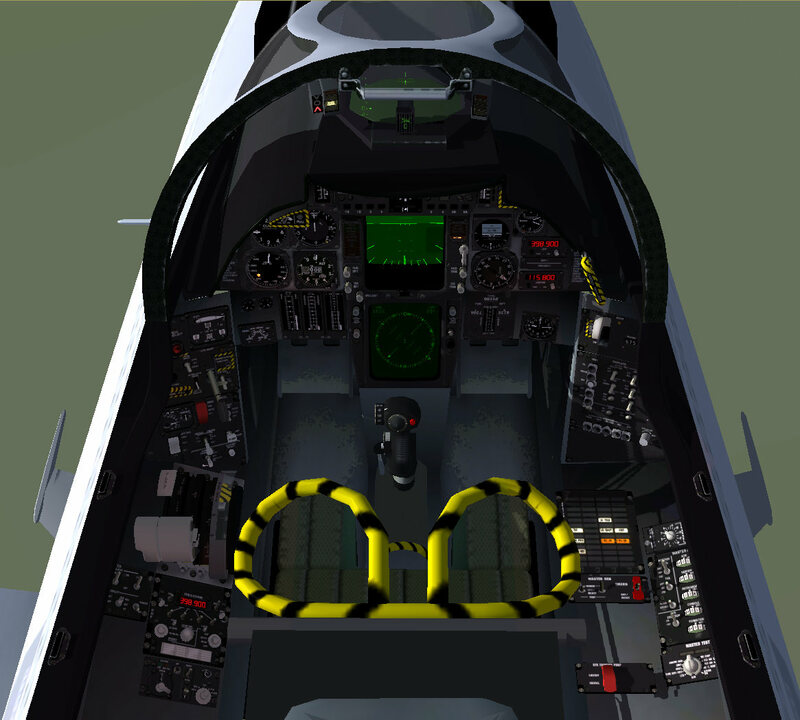 The Flightgear F-14B always had a beautiful 3D model and 3D cockpit thanks to Alexis Bory and Enrique Laso ; however I felt that the aerodynamics and flight model were not as good and so in August 2014 undertook to fix this using JSBSim and real wind tunnel F-14 aerodynamic data. This is my first flightgear model; although I've been working with flight simulators for many years professionally. Once I'd fixed the flight model there were a few changes that just had to be made; I felt that the lack of hydraulics and electrics detracted from the realism and provided a challenge to implement these using JSBSim rather than in Nasal. Using JSBSim for none FDM modelling works well. The JSBSim aerodynamics model uses all of the data in the AFWAL-TR-80-3141 report and is accurate for low speed clean configurations. I have modelled the high speed and flaps etc. based on other reports so these may not match the aircraft precisely. I've also redone most of the sound effects to make it what I consider more realistic and improved the cockpit to add missing gauges. Wing sweep (including manual sweep). Sweep interlocks are correctly modelled so when deploying flaps aux flaps can only be used below 22deg of sweep; otherwise up to 50degrees the main flaps can be deployed. At wing sweep of more than 55 degrees no flaps are available. Contrails from the wings at high alpha subject to atmospheric conditions. AFCS tuning; the altitude hold is implemented in the CADC model; the normal autopilot is used for heading and throttles. Bump / rattle noises based on what's happening with the gear strut compression. Predefined fuel loads added to external loads panel together with showing the CG%. Master warn panel with working indications for engs, fuel, hydraulics, electrics. Elevator / Rudder and spoiler gauges now connected to surfaces. In cockpit engine start & shutdown possible. Moved fuel tanks so that the CG% is roughly correct and generally within the range of the pilot's manual. Added shortcut buttons for pre-defined fuel loads. An engine start can be performed by pulling the cut off values (yellow stripy each side of the glare panel) and selecting crank (with or without external air). Once the engine N2 reaches above 18% the hyrdaulics will have sufficient pressure to power the backup electrical generator and the cockpit should light up. As all of the simulation models are in JSBSim (rather than Nasal) it runs much faster and gives a much more fluid and realistic response. The brakes control binding for joysticks will function as either ground or airbrakes appropriately. The hook now has the correct geometry so it will drag along the ground and catch properly. Corrected geometry for landing gear. Revised the spring/damping coefficients to prevent ridiculous bounciness after or during a crash. Flight modelling of aerodynamic effects when wing torn off. New canopy glass, including frosting and glare effects. New Liquid oxygen gauge, cabin pressure, and ECS panels.